Brachioplasty is any procedure that will improve the appearance of the upper arm. This may be limited to liposuction alone if the skin is fairly tight. If the skin is looser, then some form of skin tightening, with or without liposuction, is needed as well. This operation, Brachioplasty is especially welcomed by women who desire to wear sleeveless dresses. The skin tightening scar may be placed in the the groove between the biceps and triceps muscles or sometimes on the back edge of the upper arm. When the skin is very loose, then the scar may need to extend into the armpit. This may have an added benefit as some or all of the hair follicles and sweat glands may be removed! Occasionally, the scar may be placed only in the armpit or perhaps only extending for a short distance down the arm. The scars of brachioplasty will never be invisible but depending on individual healing characteristics, they may be fairly inconspicuous. The most impressive results after Brachioplasty will be seen in those patients who gained and then lost huge amounts of weight. See some examples of the results of Brachioplasty in the before and after photography. In 2002 at the World Congress of Liposuction, Dr. Sacks described a method to be used by other surgeons, for determining which is the correct procedure to be used for various upper arm problems. Dr. Sacks has written a chapter on Brachioplasty for a textbook on Body Contouring which was recently published and also lhas lectured to hundreds of surgeons from around the world at scientific meetings on this subject. Swelling is temporary and will respond to ice packs placed on the upper arms. 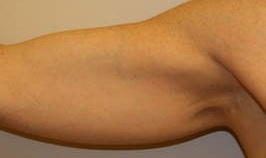 Scarring is an issue with Brachioplasty and the scar will never be invisible. How noticeable it is after surgery will depend on the patients healing characteristics. It may be placed in different areas and this will be discussed with Dr. Sacks before the surgery. Price of brachioplasty will range between $5500- 6500 depending on anesthesia chosen. If you are interested in Brachioplasty, then please call Dr. Sacks at Arizona Cosmetic Surgery at 602 277-1111 or if you are from another state, then call toll free 800 765-2771. The consultation is FREE!